Did you know May 17 is National Cherry Cobbler Day? And that includes individual cherry cobblers as well. There is a time for big pies and time for cute little individual pies. I must lean toward the latter, though, because I have so many vessels for cute little pies: Corning cornflower petite pans, white ceramic round ramekins, larger white ceramic ramekins, custard cups, tartelette tins, etc, etc. But now I have a new favorite: the Le Creuset® Cast Iron Mini Cocotte. They arrived at the same time cherries arrived at the farmers market! Hence, this recipe for individual cherry cobblers. Of course, I also will be using these adorable little cast iron mini cocottes for my French Onion Soup. They come in five colors; I chose Black, which is a flat black. Here are the colors: Flame, Cherry, Marseilles and Palm. And, of course, Black. They're all beautiful, so it was a tough decision. Perhaps I should have chosen four different colors? This recipe makes exactly the right amount of filling for 4 of these cocottes. They will settle as they cool, leaving room for a big scoop of ice cream on top! 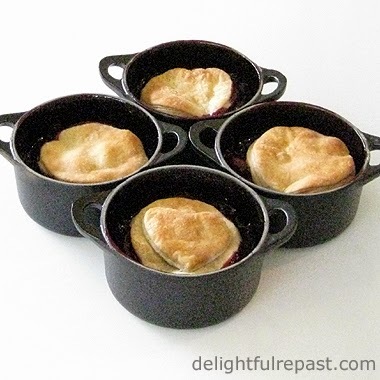 If you're using larger or smaller baking dishes, it will make a different number of cobblers. For those who are thinking it can't be cobbler if it doesn't have a biscuit topping or a cakey topping, read my (inherited) view on cobblers in my Blackberry Cobbler with No-Roll Pie Crust post. You can also make a quarter of that pastry recipe and use my fabulous no-roll method for these mini cobblers. For this batch, I used a quarter recipe of my easy Ruff Puff Pastry that I happened to have on hand. But if you really feel you must insist that pie crust makes these pies instead of cobblers, you may call them Individual Cherry Pies. I'm not going to be dogmatic about it! * If you use sour cherries (also called tart cherries), you'll likely want to use more sugar. I always use the more readily available sweet cherries. You can also use 20 ounces of frozen cherries (unthawed), but I wouldn't use canned. 1 Preheat oven to 400 degrees. In medium bowl (I use a 2-quart glass measure), whisk together sugar, tapioca flour and salt. Stir in the cherries, lemon juice and almond extract. Let stand for 15 minutes. 2 Roll out pastry to 7- to 8-inch square about 1/4 inch thick. With a 3 1/2- to 4-inch round cutter, cut out 4 rounds of dough. Put them in the refrigerator until you're ready to use them. 3 Divide the cherry filling among the 4 cocottes. Put some small pieces of butter on top of the filling in each cocotte. Top with the chilled pastry rounds. Bake at 400 degrees for 35 to 40 minutes, until the crust is golden brown and the cherries are bubbling. Let cool for about 15 minutes before serving (unless you need to peel the inside of your mouth for some reason!). This giveaway is open to US residents 18 years of age or older. Leave a comment below (one entry per person, plus see below for ways to get up to two bonus entries). First comment should include your color choice (Flame, Cherry, Marseilles, Palm or Black) and the first thing you'll make in your cocottes. Please include your email address in the body of your comment. Must enter by 11:59 p.m. Eastern time Wednesday May 21. Winner will be chosen by random drawing and be announced here in the comments before noon Eastern time on Thursday May 22. If I don't hear back from the winner of the random drawing by noon Eastern time Sunday May 25, another drawing will be held and a new winner selected from the original entrants (those who commented before the giveaway deadline). 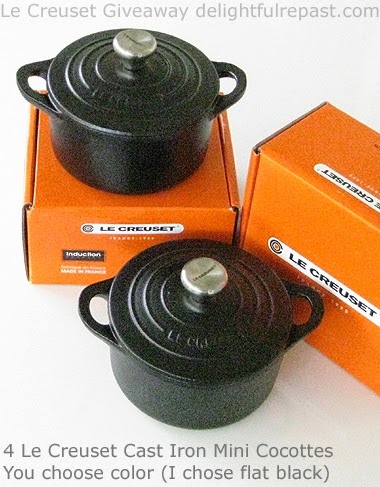 Disclosure: Le Creuset provided a set of four cocottes for review purposes and a set of four cocottes for the giveaway. I received no compensation. The views expressed here are entirely my own. I always tell my readers what I really think! The blue is gorgeous. I've been half-assing french onion soup for awhile, not having any oven-safe bowls. I'd do the whole soup, bread, guyere under the broiler bit. I think now, I will just have to buy some cherries at the Farmer's Mkt. this week! Lindsay and Joanne, yes, the blue AND the red are just gorgeous! I like all the colors, just can't decide. Maybe blue. 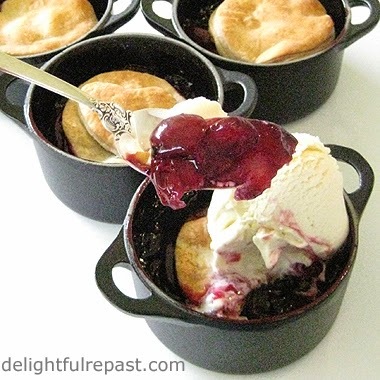 I love the idea of individual little cobblers, especially cherry. I hope I win! RED!!! I'm make burnt creme followed by cherry crumble. I'm a big fan of little pans, tarts, and ramekins. Love to have these. Oh, and potato soup with bacon, green onions, and melting cheese. Little shepherd's pies. Endless options. These will never be clean. Unknown, you're going to need to include your email address in the body of a comment in order to have a valid entry; how else will I notify you? Oh Jean, those are beautiful (the cobblers AND the little pots). On an overcast, cold day like this, I could go for one of those. I love the blue, the red, and the orange. Surprising that the green is not my favorite because green happens to be my favorite color, but the green of our alfalfa field. Okay, so I'd say the red. Isn't it stunning! The cobbler looks so good and those are the cutest little pots. I adore the red. Ah! I have always wanted cute little baking things, but I've never purchased any. I like all the colors, but I'd probably choose black, too. If I win, I'll have to order 4 extra, then make different kinds of cobblers. I love the red that Le Creuset calls "Cherry" so I would love to be able to bring those lovely little pots to the table with your cherry concoction in them! Following both of you on Twitter: @LeahNieman So cute. I love the red. I think I'll be making cherry cobblers tomorrow, they look delicious. I've always made cobblers with a scone mixture on top, so interesting to see these. Those pots are just perfect for French Onion soup, husband's favourite soup with croutons and some French bread mmm. These cherry cobblers look fantastic! All the best luck to all the giveaway participants. My color choice would be cherry. There's something I find a little confusing... You talk about how it sinks a little as it cools. I've never had a pie or cobbler cool. What is this? Is there room for ice cream while it's still burn-your-mouth-hot? That's how I do it! 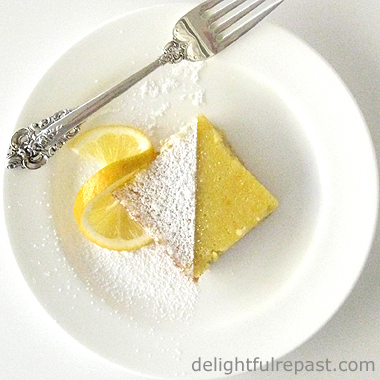 Thanks so much for sharing the info, recipe, and giveaway. Have a great weekend! I have tons of those little vessels, as you refer to them, for pastry/cobblers etc. I call them…wait for it – silverware! That’s because the goodies gloop seldom makes it out of the baking “vessel” (usually more like Noah’s Ark or an ocean liner). I just unload the cargo as soon as it clears the temp for third degree burns. Yeah, pretty to look at (the glurp, not me), but I’ll have to catch the x-ray. Anyway, I do like those bite-size treats this time of year – any time of year. I’d enter your contest for a creuset, but they all look like they are under 9 inches diameter (my lower limit for a serving). Yup, Sully, the way you burn calories you better have two! Love the mini pots, very cute! I have yet to make it out to the farmers market but you've just given me the best excuse yet and make this cherry cobbler! Probably lower in carb than a regular pie as a bonus. I would choose palm and I would make french onion soup with them first. Well, Greg, we seem to be in the minority! I love these pots and have been hankering after a set for ages! My first use would probably be for eggs baked with smoked haddock and, as there are only two of us, the cherry cobbler in the other pair for dessert! I would choose palm, and first I would make individual chicken pot pies. Thanks! I follow Le Creuset on twitter @rusthawk. I follow you on twitter @rusthawk, also. Well that's interesting, I posted from work on Thursday and yet, my post didn't make it into print! I'd take the black ones at drags59 at yahoo dot com and probably make shepherds pie for work. Hi Cheryl. For some reason, both your comments landed in the spam file, which I go through every few days, so I would have found that comment from Thursday today. Always a good idea to check, though. I know some people never check their comments' spam file. May 17 is not only the National Cherry Cobber Day but also the Norwegian Constitution Day; this year celebrating 200 years of freedom (part of Denmark until 1814). Norway's constitution was inspired by the United States Declaration of Independence! Congratulation with your blog. Great work!! Thank you, Jan. AND thank you for the world history lesson. I had no idea Norway had been a part of Denmark until 200 years ago! I would choose the blue Marseilles color. I would make either French Onion Soup or Cherry Cobbler. I'm in! Followed you & LeCreuset on Twitter as KitchenToysRFun. I have a lot of cast iron so BLACK would be a good color. Thanks for visiting & commenting on my Kitchen Toys Make Cooking Fun pasta making page. Cherry! I'd either make eggs or mini pot pies as one of my first recipes! Awesome recipe ... I can't wait to try this when my berries are in harvest soon. I follow you Jean on Twitter as well as Le Creuset. I follow from my @BG_garden Twitter account! I'd choose Cherry and I'd make french onion soup. What a wonderful give away! And the photography on your blog is lovely. I would love the Palm color! I'd make blueberry cobbler! I like the orange. I would make a personal pot pie. I'm not sure blue was the proper name for the color I like (but they are all beautiful colors) and I forgot to say, I would make chicken pot pie! Thanks! I really like the Marseilles and Cherry! Those are SO cute! Of course, being a fan of the color blue, I love the Marseilles the best! The cherry cobblers look DELICIOUS! How do you get the fresh cherries so early in the year? We won't see them in New England for another month. Entering: casualobserver21 @ gmail.com and bbcamericangirl on Twitter. And now I'm following lecreuset at @threlkelded. I like the palm color. I would make a mini pie. *Giveaway Winner Announced* - The winner, by random drawing, of the Le Creuset cast iron mini cocottes is Cranberry Morning. Cranberry Morning, as soon as you send me, delightfulrepast at aol dot com, your name, address, phone number (required by shipper) and color choice, Le Creuset will ship the cocottes to you. Congratulations! If I don't hear from the winner of the random drawing by 11:59 am Eastern time Sunday, May 25, another drawing will be held and a new winner selected from among the original entrants (those who commented before the giveaway deadline). those little crocks are so cute. love cobbler.